We are super excited to see what Bet365 do with their campaign in 2019, and if you feel as though you have some ideas about what direction they might take with their advertisements then please feel free to let us know! This connected advert was presented by Bet365 in 2017/2018. In this video you can see more of the mobile betting and gaming, which is becoming more and more popular across the worls in recent years. What we like most about the video is that you can see a number of people staying connected to what they enjoy whenever they want and wherever they want. In this clip, we see many different sets of people across the country all enjoying the Bet365 app in completely different environments. The ad is narrated throughout by Ray Winstone, who explains throughout the video the amazing features of the application itself. And of course, Ray Winstone himself. Check out our amazing review for BET365 Sports. On this ad, we see another really well put together video that benefits from some amazing camerawork and clever editing to showcase that you can be up to date with all the sporting events and bet on them anywhere in the world with the Bet365 app. I think what I like the most about this ad is the fact that it makes the application seem so universally accessible and easy to use just about anywhere in the world. This promotes the application in a very positive way and overall is what makes the ad so good in my opinion. On this ad, we see Ray Winstone (the recognizable face of the Bet365 brand) showcasing some of the amazing offers available from the betting giants. What I love about the way they create their adverts is that they really focus on the production and visuals, and I really think they do that better than many of their rivals. An example of the level of production shown by Bet365 can be seen in the tweet below, where a member of the public spotted the company recording real Stoke City fans to be used in their campaign. A really nice personal touch to them which adds a great deal of authenticity to their brand. The Change Generic bet365 ad again follows the theme of it being easy to bet anywhere in the world with the bet365 app, as it shows many different types of people in different scenarios all making the most of the mobile application. Here is our Bet365 Casino review for you to have a look at. This advert like the others similar to it really do a great job and making the app seem useful and easy to use for everyone no matter who you are or where you are, which promotes the brand really well. 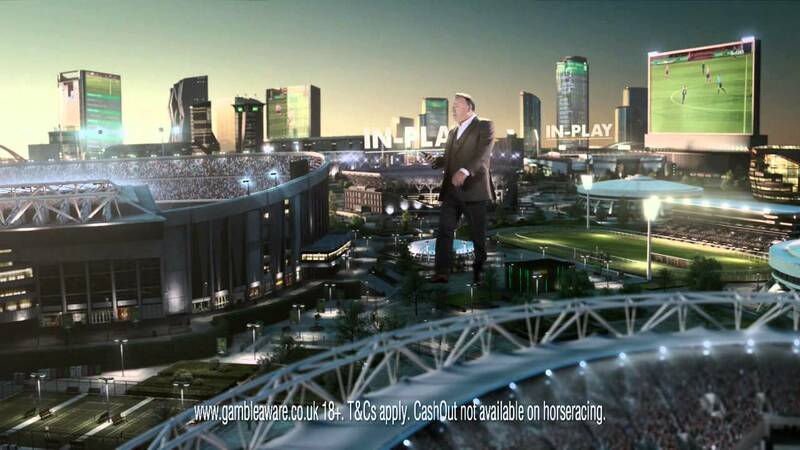 This Bet365 Advert is really well edited as we see a GIANT Ray Winstone stepping over a whole city. In this advert, Winstone steps over a range of sports that are known for betting including football at a stadium and horse racing at the race tracks. This is very smart by Bet365 as it is still funny but also relatable to the betting. 2014 was a great year for Bet365 as they created many different adverts both during matches and races and even when these sports events are not on. Ray Winstone quickly became the face of Bet365 due to the success of these adverts and his very prominent voice. In this Bet365 Ad, the traditional eerie background that Bet365 use is seen with Ray Winstone’s head in the distance. This is humorous and will interest the viewers because of this comedy. Adverts have the biggest effect when they are funny and therefore Bet365 have been very successful in most of their advertising campaigns. Take a look at this to find out about exclusive bonuses on the BET365 Games Site. At the time, these adverts were really effective because they were shown in the middle of football matches at half-time. By promoting their features, Bet365 was able to attract some people into using their applications and services to bet on the game. This is another example of great use of effective marketing for Bet 365. By using these adverts in the middle of a match, they are able to tempt viewers of the football match into betting on these games. You can find out about the history of the Bet 365 stadium here. It is smart and effective by Bet365 as the audience who are most likely to bet are the viewers of the football match and by showing their advert at half-time they will be able to target this primary audience. Check out our amazing BET365 Bingo review now. As one of the UK’s biggest betting providers, Bet365 do a great job of promoting their service through advertisement to hopeful gamblers across the UK. The voice of Ray Winstone dominates over other adverts and is a likely reason as to why these Bet365 adverts are so successful. Due to their main audience being sports fanatics, his familiar voice and recognisable friendly face relate to many football fans who love to chant for their team.